Toyota North America CEO Jim Lentz speaks in front of the Toyota sign at the new headquarters site in January. 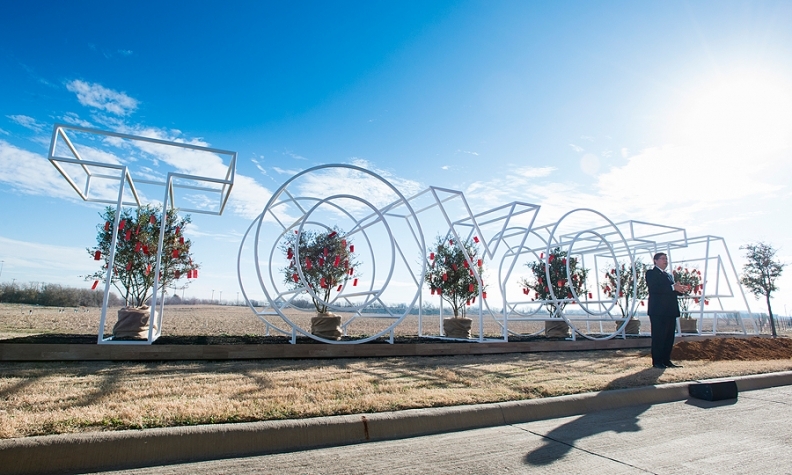 PLANO, Texas -- Everything's bigger in Texas, including the future home of Toyota's North American operations. Right now, it's little more than 100 acres of dirt being pushed around by graders and earthmovers. The only indication that it will one day house one of the world's largest automakers is a 6-foot-tall sign spelling out "TOYOTA" next to the work site. But Toyota soon will begin pouring concrete on a mammoth 2.1-million-square-foot campus that will house as many as 5,000 workers. Designs are being finalized and will be announced in the coming months, Toyota said. Construction should be finished by early 2017, and Toyota will spend the rest of that year moving roughly 4,000 employees into the new offices. The space also will be used by contract workers, who could add another 1,000 to the work force in Plano. For now, a skeleton crew of about 60 Toyota employees is working out of leased office space not far from the construction site. Among this first wave is the CEO of Toyota North America, Jim Lentz. "We are affectionately known as the pioneers," Lentz said in an interview at the temporary office, which Toyota is in the middle of renovating for the roughly 600 employees who eventually will be housed there. When Toyota announced the move in April 2014, many billed it as a means to cut head count. That's not the case, Lentz said. "There may be some redundancies, and there will be some jobs that we shed, but it's not going to be through cutting people," Lentz said. Just how many people from Toyota's Torrance, Calif., and Erlanger, Ky., sites will choose to move is a big unknown. Although Toyota is said to be offering generous incentive packages to employees who decide to relocate, one expert told Automotive News last year that Toyota management has concerns that as few as one-third of employees may choose to uproot their families from California or Kentucky. "Frankly, if this was just a mere relocation, this would be pretty easy," Lentz said. "But this is really taking a sales headquarters, a manufacturing and r&d headquarters, corporate headquarters and kind of melding them into one, high-performing team. And that's where the challenge comes in." Toyota will be a big presence in the increasingly crowded Plano neighborhood known as Legacy West. Across the street from its vast construction site, the new headquarters for FedEx Office are nearly complete. Boston-based Liberty Mutual Insurance has announced plans to develop a campus at a site down the road. Other neighbors include Frito-Lay, Pizza Hut and J.C. Penney.